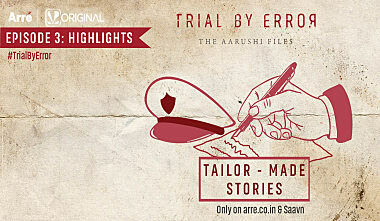 Trial by Error, An Arré-Saavn Original, produced by Jamun, is adapted from Avirook Sen’s haunting book Aarushi, is an eight-part investigative audio series that narrates the story of the Noida double murder, and the controversial trial that convicted the Talwars. Follow investigative journalist Nishita Jha as she turns a lens on the murky details of the case to see whether justice truly has been served. This episode examines how rumours tainted the investigation. Send us your feedback at trialbyerror@arre.co.in. Follow investigative journalist Nishita Jha as she turns a lens on the murky details of the Noida double murder and the controversial trial that convicted the Talwars. Aarushi's cousin speaks about how she continues to struggle with her loss. Most people connected with the case have gradually managed to move on. But some still struggle with the horrors of the deaths. Did the prosecution ever really prove AGL Kaul's allegations in court? Dr Dahiya's conclusion was simply built upon the image that AGL Kaul had created of the Talwars. Dr Dahiya makes a poor defence for the statements he made in court. Were the Talwars simply the victims of circumstances? The judgment in the Noida double murders referred to Aarushi Talwar as “a beaut damsel” who “had hardly seen 14 summers”. What causes our eminent judges to use such florid language? Richa Anirudh speaks to renowned psychiatrist, Dr Vohra, on the misconceptions around how grief is expressed. Avirook Sen sheds light on the CBI’s strange choice in creating an email address under the name of a dead man. Patrick French’s break-down of the case and the media’s appalling response to the murders is chilling. A relative of the Talwars on the public and media’s analysis of Nupur’s composure during the infamous NDTV interview. Sonia Singh recalls talking to Nupur Talwar, whom the media quickly accused of murdering her own daughter. On May 24, 2008, Nupur Talwar made the grave error of not expressing grief in front of the cameras, and millions of prime-time news viewers. How did two teams of the same investigating agency draw two different conclusions? Rajesh Talwar’s friend, Rohit Kochhar, altered his testimony after two years. Was this an attempt to stain the image of the Talwars? Rohit Kochhar describes AGL Kaul, the man who led the second CBI team. Where were the golf clubs really kept? How the second CBI team built their case against the Talwars. Television and radio host Richa Anirudh discusses the investigation of the Noida double murders with Vinay Tewari, former managing editor of India Today Television. DNA expert Andrei Semikhodskii on the many questions that were left unanswered. Dinesh Talwar on how the police went contrary to the evidence. Who handled the bottle last? Rebecca John talks about the lack of crime scene protocol in India. 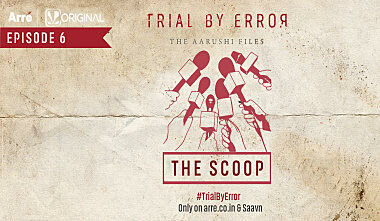 On the 8th death anniversary of Aarushi and Hemraj, Rajdeep Sardesai, consulting editor, India Today Television speaks to Sanjay Ray Chaudhuri, co-founder, Arré, on media trials. Nishita Jha on the domestic staff of the Talwar's. Listen to Aarushi's grandfather talk about the moment when they heard about Aarushi's death. In India, the help is a set of arms and legs with a heartbeat. "People like them" are different from "people like us" and the chasm is deep. Until they make the crossover.